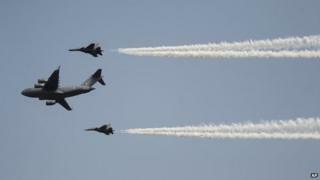 Are India's ageing air force planes falling out of the sky? All air forces have accidents, but accounts of Indian warplanes crashing on training flights have become almost routine news. The latest incident came earlier this week, when a Russian-made Sukhoi-30 crashed in eastern India - both pilots surviving after ejecting for unspecified reasons. All five crew died in March this year on a training flight in their US-made Hercules transport aircraft. But it is the Russian-made aircraft that form the backbone of the Indian fleet which have been the most accident-prone. The MiG jet in particular has become known as the "flying coffin" or the "widow maker". Two years ago, India's then defence minister told an astonished parliament that more than half the 872 MiGs it had purchased from Russia had been lost in accidents, at a cost of over 200 lives. Yet only this month the air force chief warned the delay in introducing replacements was putting India's security at risk as parts of the fleet were on "their last legs". Meanwhile, India's regional rival China continues to leap ahead in both spending and firepower. Indian-designed warplanes have so far not been up to the job. But more than two years since a deal was signed to buy 126 Rafale fighters from France, the bargaining goes on. Some say it's not what India needs though. If it does eventually buy French, that will only worsen matters, warns Delhi-based defence analyst Bharat Karnad. "We have a diversity problem," he says, referring to the wide variety of planes the air force already uses, "making it much harder to keep training and maintenance up to standard". The Russians have also been accused of being tardy with supplies of spare parts. India - now the world's largest arms importer - is increasingly turning to the West for its weapons. The US is now its number one supplier. Yet Mr Karnad fears Western nations will hold up critical spare parts and support "as a means of political leverage on India", something he believes the Russians are less prone to do. But it's not just the air force that has a problem with its gear. Just yesterday [Tuesday], a former Indian navy chief lashed out at defence ministry as "so dysfunctional" he couldn't even order "a set of batteries" for his submarines. Admiral DK Joshi made headlines last year after resigning following a series of submarine accidents that left 18 sailors dead. As it happens, the vessels involved were also Russian-made. The new Prime Minister, Narendra Modi, partly won office on the back of hopes he will put India on course to becoming a superpower and has promised to modernise the military. But it's an old challenge, says retired navy officer Uday Bhaskar. "Finding the solution is something that's eluded every Indian leader until now."